Dr Dashfield qualified from Birmingham University Medical School in 1988 and spent the subsequent 14 years as a Medical Officer in the Royal Navy reaching the rank of Surgeon Commander and tri-service consultant advisor on pain management to the Surgeon General. Dr Dashfield undertook basic anaesthetic training in Plymouth and the Sheffield Teaching Hospitals. Higher specialty training was undertaken at London’s Great Ormond Street Hospital and the Royal Brompton Hospital and finally at Derriford Hospital, Plymouth. Additional Chronic Pain Management experience was gained in the Pain Relief Unit at St. Mary’s Hospital, Paddington. At the end of his training, in 1998, he won the Royal Society of Medicine Registrar prize and Gold Medal for Anaesthesia. Dr Dashfield was awarded the Doctor of Medicine degree (MD) by Birmingham University in 2001, a Masters Degree in Medical Education (MSc) by Exeter University in 2009 and a Masters Degree in Medical Leadership (MSc) by Warwick University in 2012. He was a Consultant in Anaesthesia and Pain Management at Derriford Hospital, Plymouth for 12 years before moving to the Isle of Man. 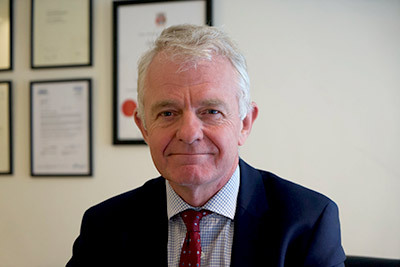 He was a Primary and Final Royal College of Anaesthetists Fellowship (FRCA) examiner from 2006 – 2018, and is a founding Faculty of Pain Medicine (FFPMRCA) examiner since 2010. He has reviewed research papers for medical journals. Other than his specialty interests in Pain Management and Anaesthesia, Dr Dashfield is active in the field of medical education of undergraduate and postgraduate medical trainees. He is Director of Medical Education at Nobles Hospital and a Fellow of the Academy of Medical Educators.